It's back and bigger than ever! 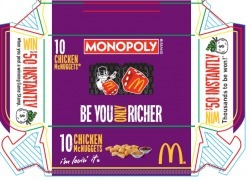 Developed a "Be You Only Richer" thematic that highlighted the fact that real people really do win MONOPOLY at McDonald's. Even though players have more chances than ever to win $1 MILLION (a chance every day online), we know the cash will change their life but won't change them. We told the stories of past winner's through fun, engaging rebus style stories. 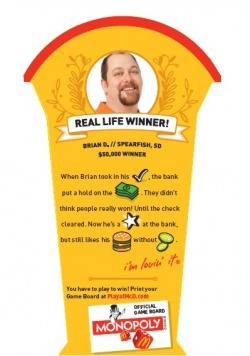 This year's winners are highlighted in the online game. 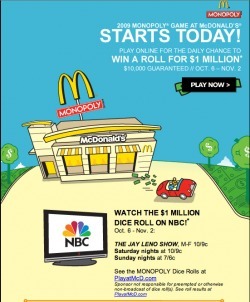 The biggest news of all, the daily $1 MILLION Dice Roll takes place during The Jay Leno Show on NBC. Plus, this year players could even play through Facebook. With lots of news to tell consumers via packaging, in-store elements, online, mobile and email it may be the most I've written for a single program. Factor in the crew program (including the video for which I did the V.O. ), and I probably hit my own 1 million mark. But it was all worth it -- for me and hopefully more than a few lucky players out there as well. I definitely hit the million-word threshold on this project. It's my great American novel, well I at least came up with some novel ways to make some okay rewards sound whole lot better. There were also plenty of pretty darn good rewards as well. It started out as a project to revamp the way they wrote their reward descriptions, parlayed into development of an awareness campaign, got a bit bigger by implementing the My Coke Rewards for Schools program and became huge when we revamped the whole site. Lots of thinking, strategy and branding to go with all those words. 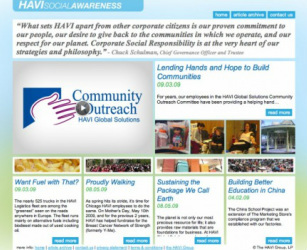 Developed a social awareness website highlighting all the good that the HAVI company does. Wrote news column style stories to raise awareness and inspire in-network companies, individuals, any and everyone to take the time to help with a cause that matters to them--from local charities to the environment. 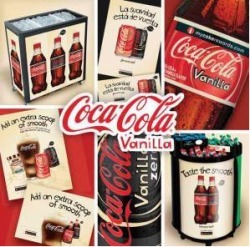 Branding and execution assignment for the re-launch of Vanilla Coke. 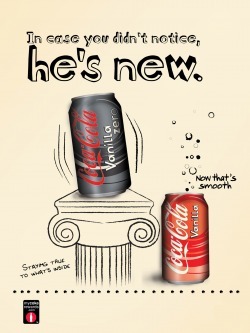 Using the inspiration of Napoleon Dynamite (and others like him), developed a brand personality for Vanilla Coke that played off "being Vanilla" as being cool. 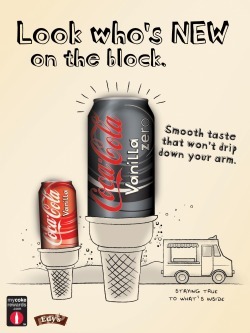 Vanilla Coke stays true to what's inside the classic Coca-Cola flavor with a smooth vanilla twist. Consumer's who drink it are encouraged to do the same taking pride in their own quirky twists that make them who they are. 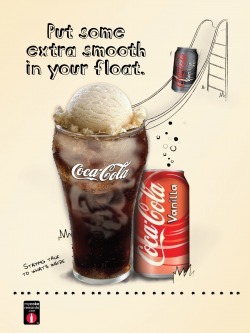 Campaign featured a playful look and voice that highlighted the uniqueness and flavor of Vanilla Coke. Programs featured POS, sampling and local market programs including a national and store-brand ice cream partnership. 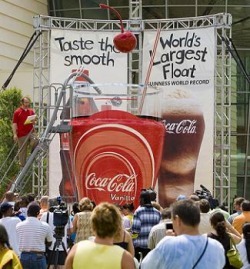 Ice partnership lead to a Guinness Book of Records Event--creation of the World's Largest Float. 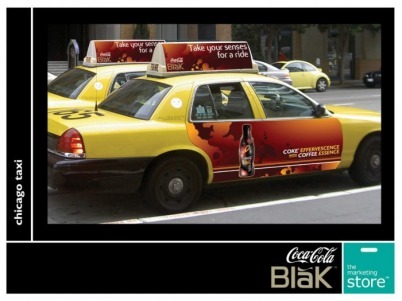 Developed programs for the launch and rehit of Coca-Cola BlaK. Programs leveraged "Stimulating Connection" platform. 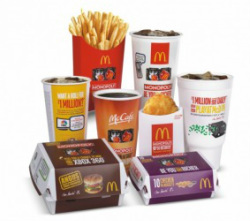 Strong focus on trial through multi-city BlaK Box sampling program. 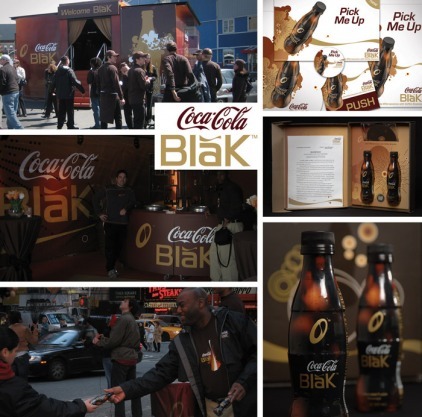 BlaK Box created intriguing and different sampling environment that played off the sense-stimulating aspects of the product. In-store focused on the path consumers take -- hitting multiple touchpoints at 200/20/2 ft level with varying messages. Rehit featured out-of-home campaign in targeted cities to keep the product flowing via billboards as well as train, bus and taxi wraps.